Today, AMD launched three new 50-series Phenom X3 triple-core processors, these will range in speeds from 2.1GHz to 2.4GHs. The new 50-series Phenom X3 processors are also free of the TLB erratum that was present in the previous revision of the silicon as are all of the Phenom processors in the XX50 series. 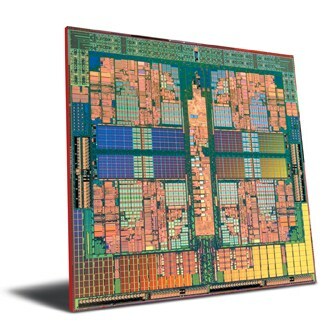 The new Phenom X3 processors can be found priced between $145 and $195 depending on the particular model purchased. The three models being released are the 8450 (2.1GHz, $145), 8650 (2.3GHz, $165), and the 8750 (2.4GHz, $195). Since the new Phenom X3’s will be priced below the X4 lineup and has a max TDP of 95W, they are a good compliment to the new AMD 780G platform, seen in our recent review of the Asus M3A78-EMH HDMI. As you can see the 8750 is essentially the more cost effecient sibling to the 9XXX series Phenom processors while running cooler due to running one less core. AMD has additionally reduced the HT speed from 2.0GHz to 1.8 on the triple core processors which may be an effort to avoid an internal CPU war between Phenom X4 and X3’s. Additional differences include the L2 cache which is 1.5MB total as opposed to 2MB on the X4’s which is reflective of the disabled 4th core.